Polyethylene terephthalate bottles, most commonly referred to as PET bottles are popular for storing liquids due to the numerous benefits they provide both to users and manufacturers. These benefits include but not limited to its ability to be; resealable, recyclable, flexible, moldable etc. Traditionally, in the Pharmaceutical, Food and Beverage industries, PET bottles are used for packaging chemicals and storing carbonated /still and distillable drinks, fruit juice and bottled water. It is pertinent for industries that use PET bottles to carry out appropriate tests in order to determine if seals, seams or closures of packages have leaks or pressure problems, as this could negatively impact on the content of the bottles. a digitalized and reliable instrument that checks the integrity of the seal caps or twist crowns. 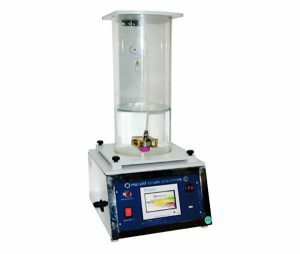 The secure seal tester is a very reliable instrument that is easy to use. It has a touch screen interface with user-friendly features for detecting gas leakage as opposed to detection of liquid, giving more sensitive and accurate readings. We are a professional services firm focused on making transformation a reality. © 2019 FEH Projects. FEH Projects Ltd. All Rights Reserved.